As you can see I have quite a bit o' crap ( and this isn't all of it ) and it's taken 5 years to get this to maximum clut-age. Almost every artist and programmer has shifted offices, usually as we get new projects. I, through luck have had every team I've worked on be in my area of the building. 2. 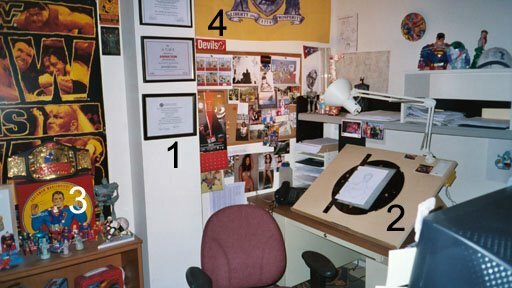 The ol' art table, for those occasions where I take a break from the 3D realm, I have the usual assortment of animator/geek crap which adorn it's facade..Such as a broken Pinky & The Brain lamp, Mr. Incredible and Batman action figures, and a snowglobe with Red Hot riding Hood in it. Well, there it is..If I ever move to a cubicle it'll be hell to move..Plus I can't fit it all in there, my office already looks like " Sanford and Son ". Ah it's been awhile and I've finally gotten over my Caribbean hangover..I tell you being drunk and on a Disney cruise is an odd thing, and yet highly recommended. 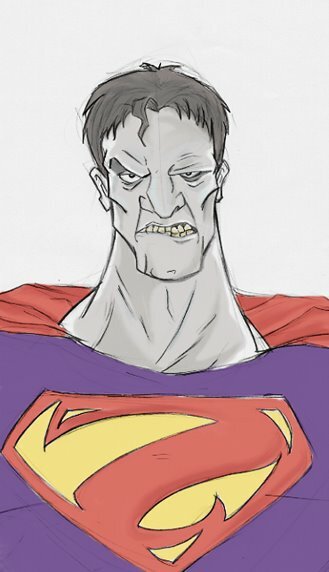 Thought I'd get to posting again, so I startred off with a sketch of Superman villian " Bizzaro"...he actually looks like he's had a couple of cocktails. It was fun to get back to the sketching.